A honeymoon in Tuscany: can you picture anything more romantic? Though we (before our Italy addiction set in) honeymooned in the Bahamas, we have long said that Tuscany is our perfect honeymoon destination and that if we were getting married today, it’s where we would go. 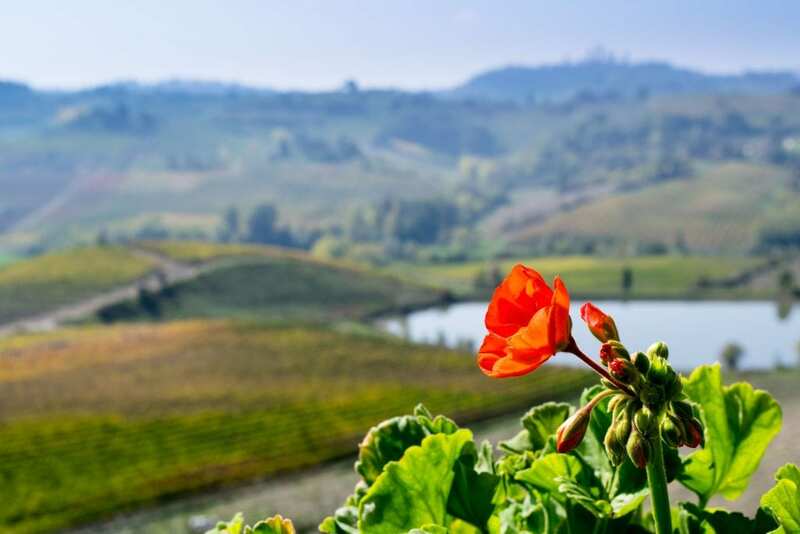 In Tuscany, romance reigns supreme–from the lighting to the landscape to the activities available, everything in the atmosphere conspires to make a Tuscany honeymoon an utterly unforgettable affair. Trying to plan the perfect honeymoon in Tuscany? 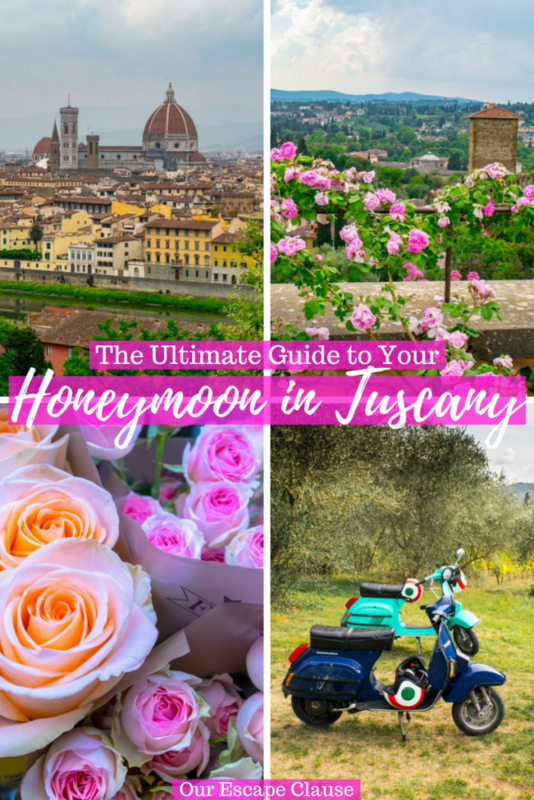 This guide will help–find out where to go, what to do, and how to make sure your honeymoon in Tuscany is as perfect as the wedding day that precedes it. 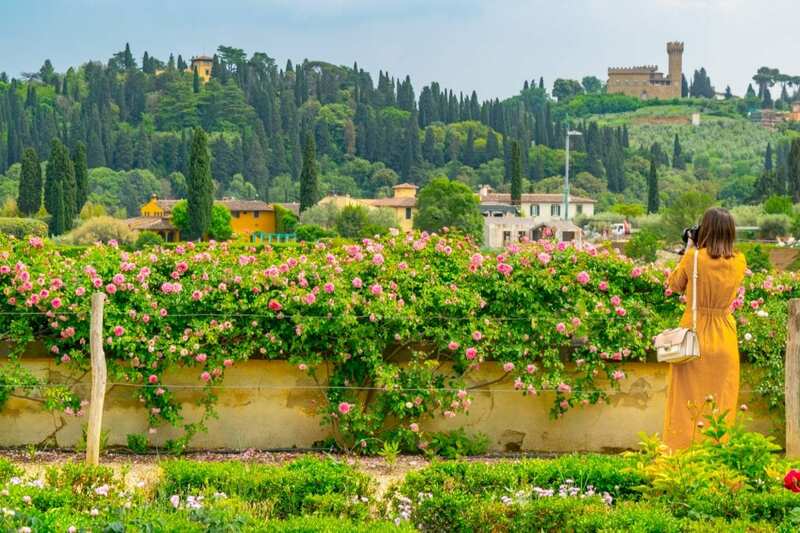 There are countless things to do in Tuscany, from the classic to the offbeat–here are some of the most romantic options that should definitely make your honeymoon itinerary in Tuscany. As the Cradle of the Renaissance, Florence is home to gorgeous architecture, beautiful art, and some of the best food in the world–it is, hands down, one of our all-time favorite cities, and it is a romantic gem just waiting to be explored. 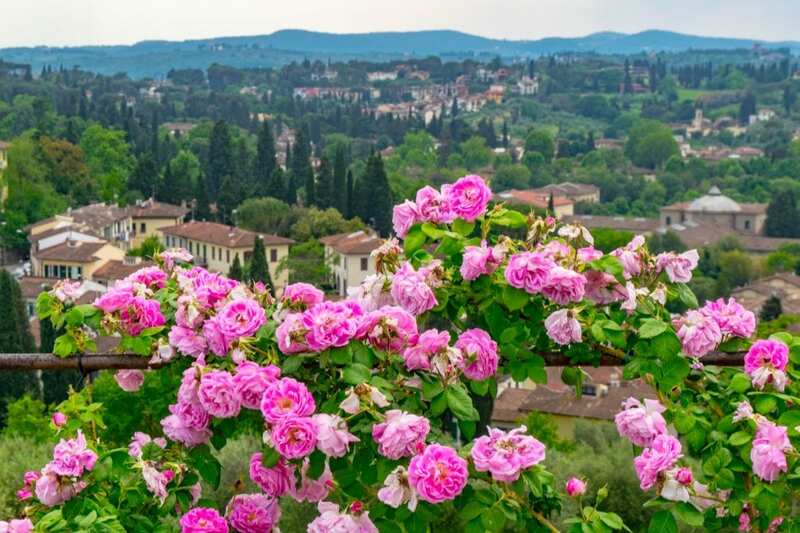 Admire views of the city at the Piazzale Michelangelo or Giotto’s Bell Tower, steal a kiss from your new spouse in the Boboli Gardens, sample delicious gelato, admire iconic artwork like Michelangelo’s David, and get lost hand-in-hand down picturesque streets. Take a luxurious wine tour. There are a million and one options for wine tours in the region, but for a honeymoon in Tuscany, you’ll want only the best: pick an all-day tour with a small group (or even just the two of you if you want to splurge! ), and settle in for one of the best days of your life as you work your way through vineyard after vineyard. 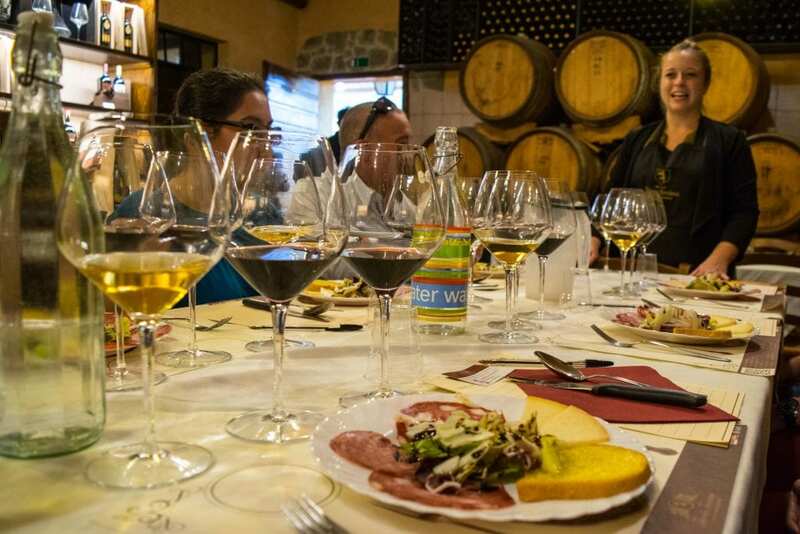 This wine tour is a great way to kick off your time in Tuscany! Want a tour that goes into a little more depth? Consider this tour, which will allow you to not only do a wine tasting but eat a romantic dinner in a vineyard! 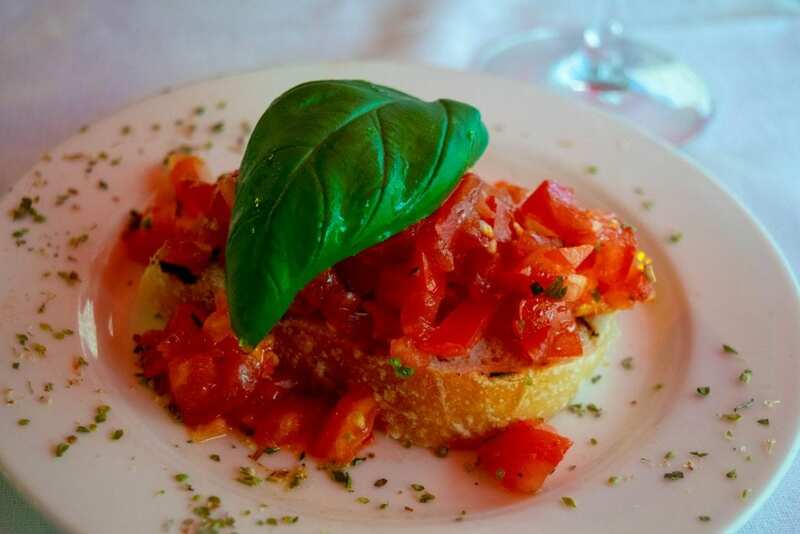 Tuscany is nothing if not a food destination: indulge in long, slow, romantic meals here, complete with multiple courses and wine! There are endless dishes to try, but the bistecca alla fiorentina is arguably one of the most honeymoon-friendly dishes in Tuscany: not only is this steak one of Tuscany’s best-known dishes, each steak typically serves two! If you want to learn more about Tuscan cuisine before diving in, consider taking a food tour together to learn the basics. Break out your creativity and get cozy in the kitchen together: cooking classes in Tuscany tend to come with large amounts of food, plenty of opportunities to work together, and endless glasses of wine–it’s the perfect honeymoon activity! 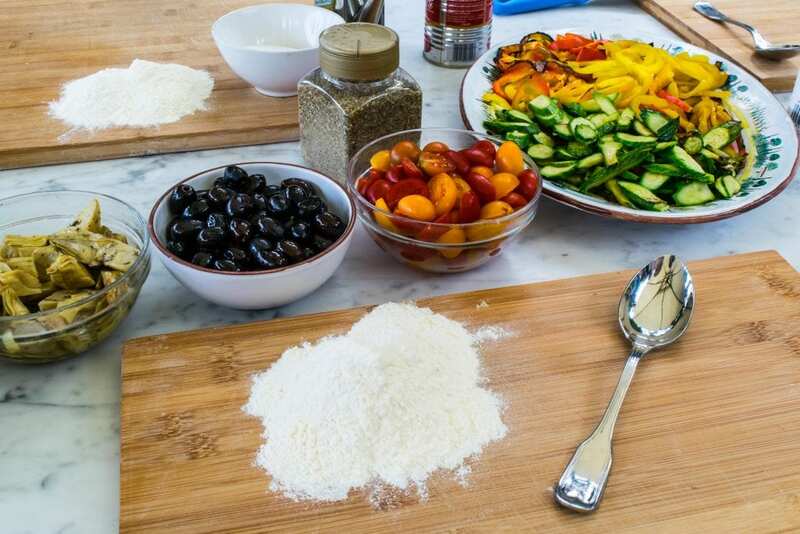 This is the cooking class we took in Tuscany, and we can’t recommend it enough! Wander the small streets of Tuscan towns. The Tuscan countryside is dotted with oodles of adorable towns, most of them dating back to the Middle Ages or beyond. These spots are perfect for wandering aimlessly together, learning a bit of history, and enjoying a quiet meal down a small side street. Shop for some gourmet souvenirs. Don’t let your Tuscany honeymoon end on the plane ride home: the best souvenirs available in Tuscany are all edible! Take (or ship) home bottles of wine, olive oil, or prosecco, along with plenty of cheese (most shops will vacuum pack some impeccable parmigiano-reggiano or pecorino for you), cantucci cookies, limoncello, spices, truffle oil, balsamic vinegar, and more! Admire the Tuscan countryside from above. A honeymoon in Tuscany is the perfect time for an unforgettable splurge, and that’s exactly what a hot air balloon ride over Tuscany provides: an experience you’ll never forget. Tuscany’s landscape is iconic, and admiring it from above with your beloved is the perfect addition to any Tuscany honeymoon. Ride a Vespa through the rolling hills together. 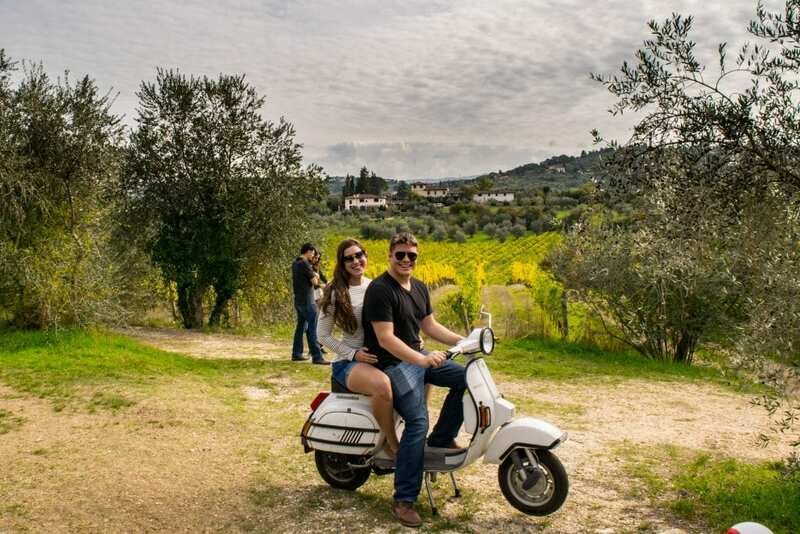 Cling to each other on the back of a vintage Vespa and take to the open road: of all the things to do on a Tuscany honeymoon, I’d have to say this is the one I’d be most insistent on squeezing into the itinerary. It is unbelievably romantic to hold each other tight while zipping through the countryside–and many Vespa tours will include a lunch at a beautiful overlook, as well. Book your vintage Vespa tour! Go horseback riding through the Tuscan vineyards. Get up close and personal with the vineyards: a horseback ride through Tuscany’s vineyards provides the perfect romantic backdrop for any couple on their honeymoon. 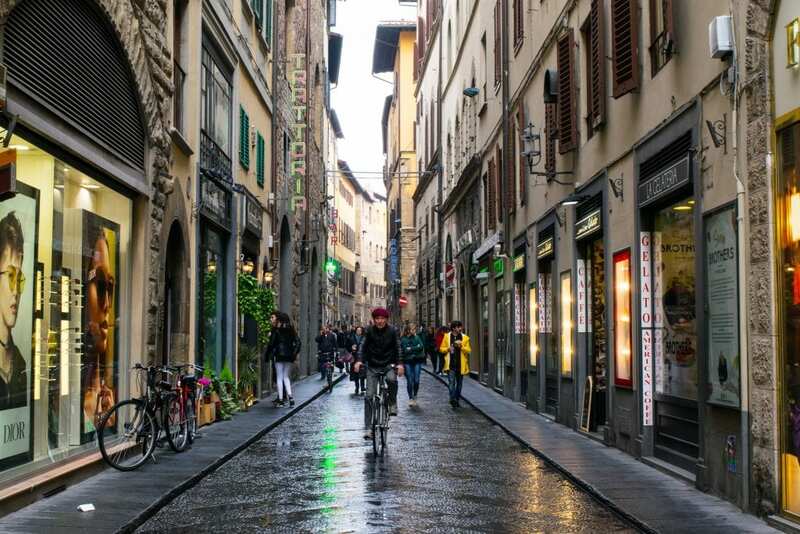 Most rides will also include other perks, like a wine tasting, a lunch, or a visit to a beautiful Tuscan town (if you’re starting from Florence, San Gimignano is a popular choice). 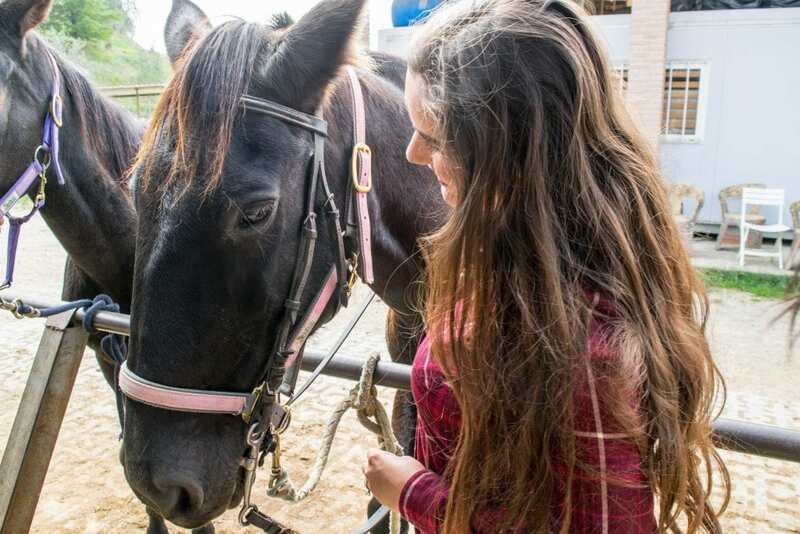 Schedule your horseback ride in Tuscany! To pull off the perfect honeymoon in Tuscany, you’ll need to find the perfect place to stay. We strongly recommend spending at least half your time based in Florence (to explore the city as well as to use it as a base to take day trips to surrounding areas), and if you’d like to try another area, moving onto either Siena or to a small town in the countryside for a taste of something different (note that for a small town, you’ll likely want to rent a car to get around outside the city). 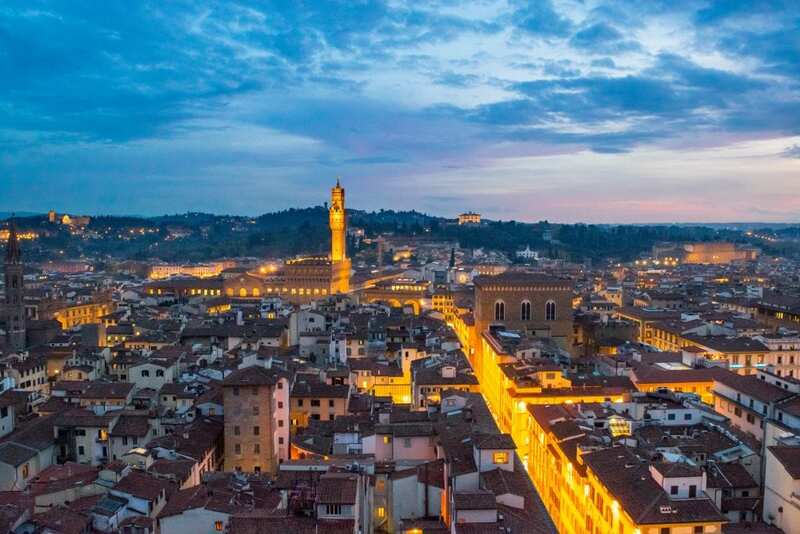 As the capital of Tuscany, the Cradle of the Renaissance, and one of our favorite cities in the world, Florence is our unabashed first choice for a base when looking for where to stay during your honeymoon in Tuscany, and you should definitely spend at least part of your trip here. 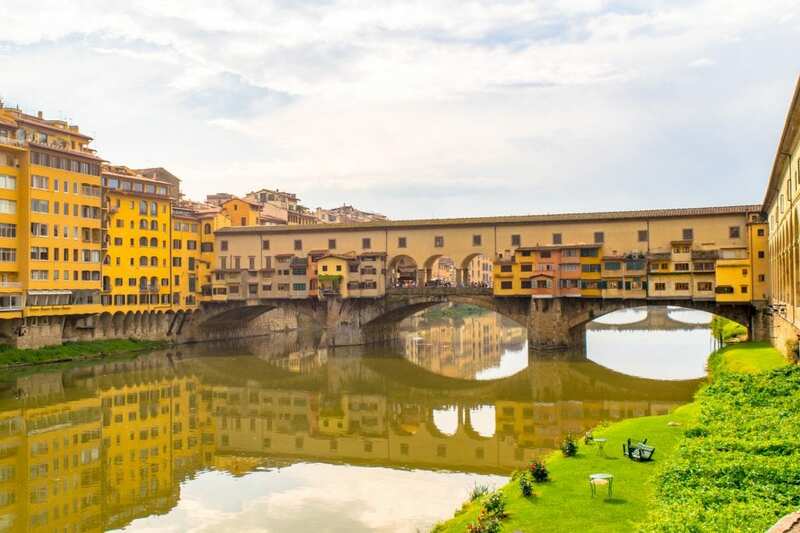 In addition to charms like the Ponte Vecchio, the Piazzale Michelangelo, the delicious restaurants, The Uffizi Gallery, and more, Florence is also home to dozens of excellent tour companies, making it a great base for exploring the Tuscan countryside from. B&B Le Stanze del Duomo (8.8 rating on Booking.com) — It’s true that budget honeymoon-worthy hotels in the heart of Florence can be a bit hard to come by, but even with the slightly-higher-than-normally-means-budget-hotel prices, B&B Le Stanze’s beautiful rooms and impeccable location in Florence will be sure to have you swooning! Antica Dimora Firenze (9.1 rating on Booking.com) — If you’re willing to compromise a bit on a central location, Antica Dimora Firenze can offer you a picture-perfect bed & breakfast setting at a very competitive price for Florence! 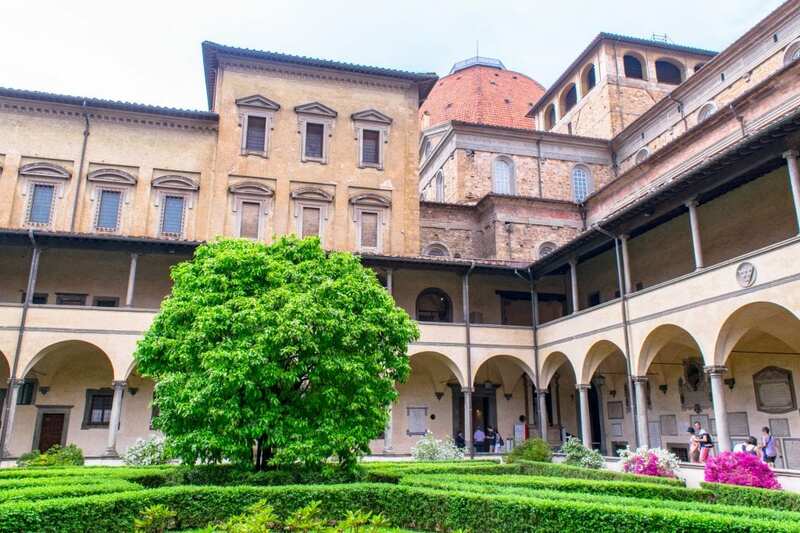 Palazzo Graziani (9.1 rating on Booking.com) — If you’re looking for a beautiful view of Florence’s skyline, Duomo and all, for your honeymoon in Tuscany, be sure to check out the Palazzo Graziani! Atlantic Palace (8.4 rating on Booking.com) — Beautiful and romantic, the Atlantic Palace is in the San Lorenzo neighborhood of Florence, within easy reach of bustling markets and the Duomo. Come home to wood-beamed ceilings, cozy rooms, and perhaps even a view of the Duomo itself. Hotel Lungarno (9.3 rating on Booking.com) — Nestled right against the Arno River and home to one of the best views of the Ponte Vecchio in Florence (not to mention some of the best views of the rest of Florence from their top deck), Hotel Lungarno is our personal “if we ever really want to splurge” hotel in Florence. Its romantic setting, beautiful rooms, and flawless location make it the ultimate honeymoon hotel in Florence! Helvetia & Bristol Firenze (8.7 rating on Booking.com) — Stunning views, opulent rooms furnished with antiques, and an excellent location just a 5-minute walk from the Duomo: Helvetia & Bristol makes a fantastic choice of where to spend your honeymoon in Tuscany. Tuscany’s second-largest city manages to feel a world away from Florence while still also feeling incredibly Tuscan. This is an excellent place to base yourself if you want to try a second spot in Tuscany but don’t want to leave city life behind after Florence, if you’re a fan of amazing views (Siena has a high concentration of beautiful viewpoints), and if you’re interested in medieval history. 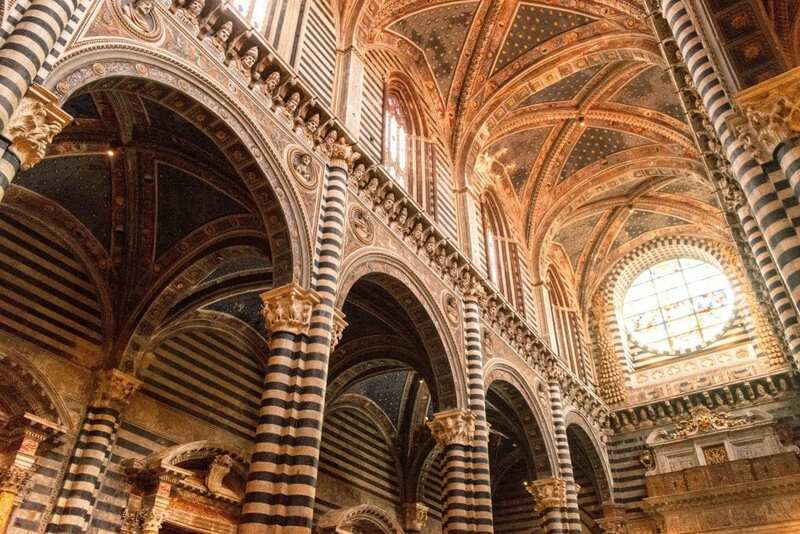 You won’t need more than a couple of days here unless you’re using it as a base to explore parts of the Tuscan countryside, but Siena is definitely an asset to any Tuscany honeymoon itinerary. 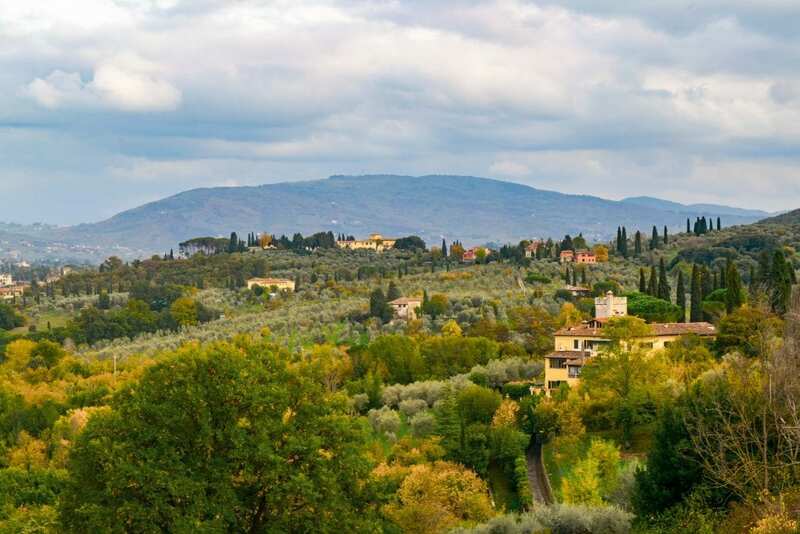 Hotel Santa Caterina (8.9 rating on Booking.com) — Housed in an 18th-century villa with sweeping views of the Tuscan countryside, Hotel Santa Caterina is a fabulous combination of affordable and romantic! Hotel Italia (9.0 rating on Booking.com) — LIght, airy, and beautiful, Hotel Italia is the perfect romantic getaway in Siena. 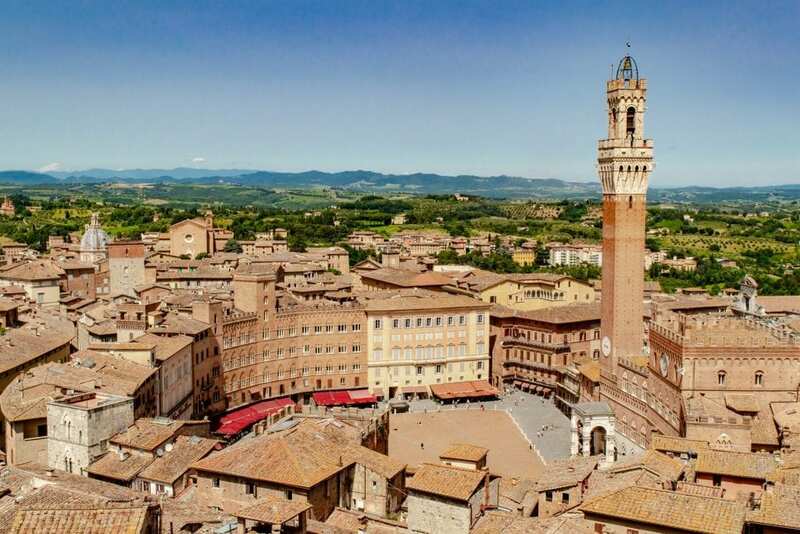 Set about a 20-minute walk from the center, you’ll likely find you won’t mind compromising on location: the walk through Siena to reach its main attractions is half the fun of being there. 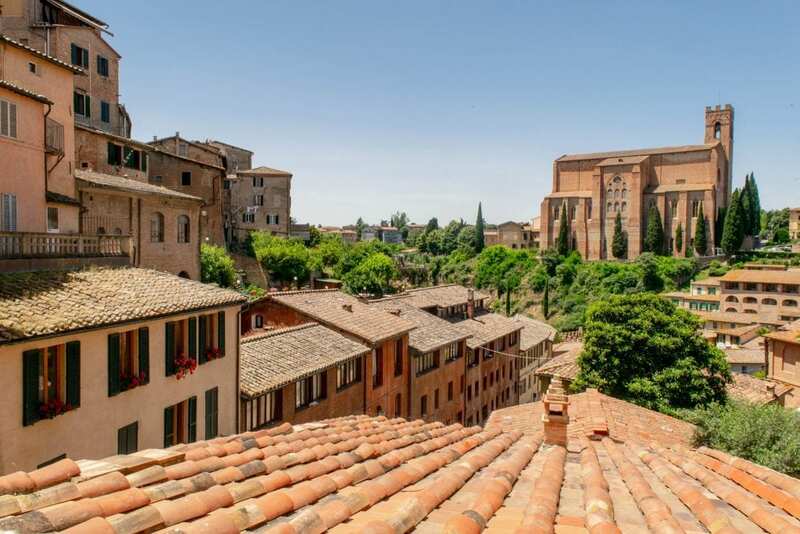 Hotel Athena (9.0 rating on Booking.com) — Located inside Siena’s walls, you’ll have trouble pulling yourselves away from Hotel Athena’s stunning terrace and restaurant to explore Siena! Not much of a city person? Grab a rental car (more on that below) and take to the countryside: there are countless beautiful, tiny cities and towns in Tuscany surrounded by rolling hills and beautiful vineyards–if your idea of the perfect Tuscany honeymoon is to find some seclusion, find an epic hotel and cozy up with your beloved in a setting fit for a movie. Antica Residenza del Gallo (9.0 rating on Booking.com) — Looking for a smaller city to stop in during your Tuscany honeymoon? Consider this cozy hotel in the heart of Lucca–the warm interiors, wood-beamed ceilings, and delightful location will make sure you don’t forget for a single second that you’re in Tuscany. Il Casale del Cotone (9.0 rating on Booking.com) — What honeymoon in Tuscany would be complete without a stay in a Tuscan farmhouse? This renovated home boasts antique furnishings, beautiful panoramic views, gorgeous rooms, and a setting among olive trees nestled in the Tuscan countryside–it’s the ultimate honeymoon escape! 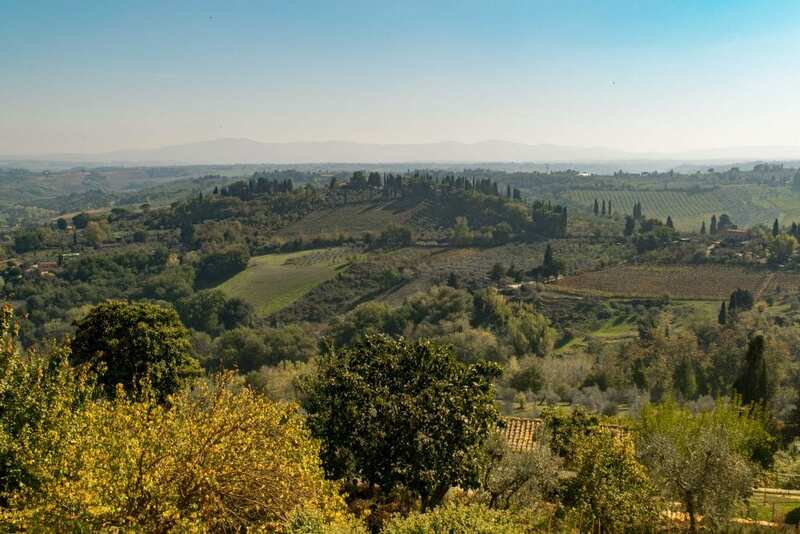 Castello Banfi – Il Borgo (9.5 rating on Booking.com) — Want the ultimate Tuscany honeymoon experience and have some cash to blow? Try staying in a castle! Castello Banfi will spoil you with its enchanting rooms, impeccable grounds, and beautifully decorated interiors–not to mention its romantic atmosphere! Beyond Florence and Siena, Tuscany is bursting with beautiful towns waiting to be discovered. Whether you have a whole day or merely an afternoon to spare, consider working these spots into your Tuscany honeymoon itinerary. 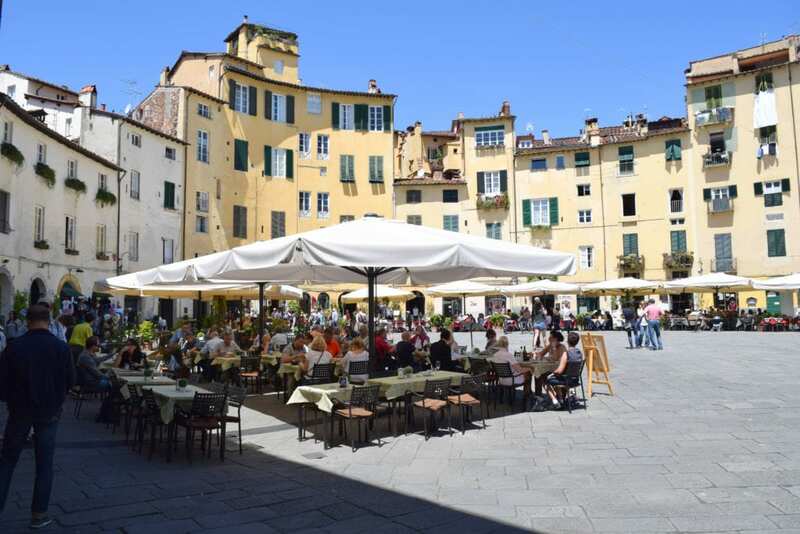 Lucca’s most distinctive trait is its beautiful square… and that is because it is not a square at all. Lucca is home to a central “square” that is a perfect, lovely oval. Other perks of a visit to Lucca (which makes an easy day trip from Florence) are its imposing town walls, where you can walk or bike across the top of them all the way around town, and its incredibly walkable town center that is perfect for exploring, whether you’re looking for food, clothes, or souvenirs. Perhaps the most famous day trip in Tuscany, Pisa is honestly one of our least recommended stops for a Tuscany honeymoon: it’s insanely crowded, and the town doesn’t have much unique to offer outside of the (admittedly beautiful) leaning tower complex and nearby museum. If you just can’t bear to leave Tuscany without taking some selfies with each other at the tower, you can combine Pisa with Lucca for a great Florence day trip. If you do want to climb the tower in Pisa, save a lot of headache and book your tickets & entrance time in advance! Dating back to the Etruscans, Volterra sits proudly on top of one of Tuscany’s hills and appears both imposing and regal as you approach it from below (you may also remember it as a setting in the second installment of the Twilight books/movies). 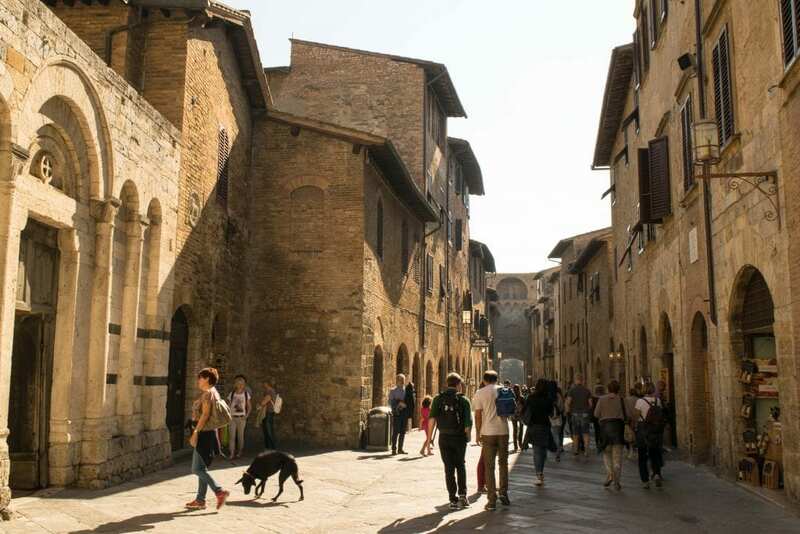 Volterra’s winding stone streets and setting overlooking the Tuscan countryside will have you two smiling and walking hand-in-hand the moment you arrive. 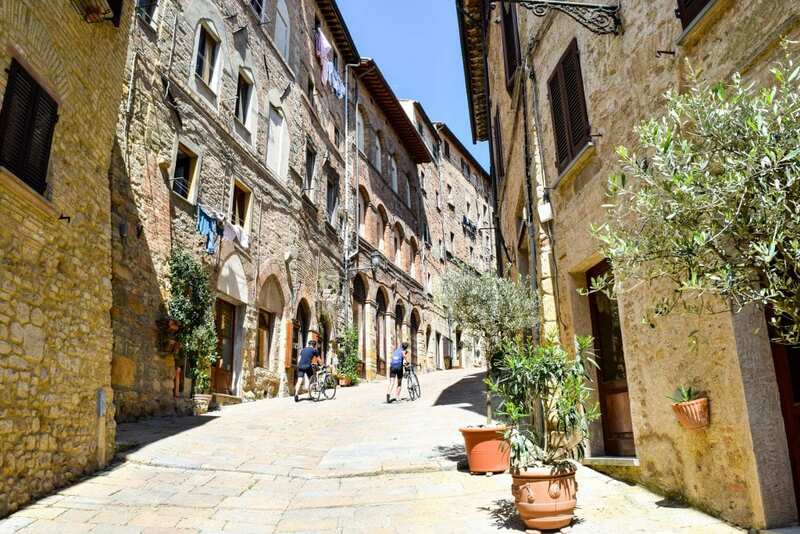 Set in the eastern part of Tuscany, Cortona is full of sunny piazzas and beautiful viewpoints that show Lake Trasimeno shimmering in the distance. It makes the perfect stop if you’re looking for a quaint Tuscan village setting with fewer crowds than somewhere like Florence or Siena, while also staying somewhat on the beaten path in Tuscany. Consider stopping by on a weekend, when markets are lively! 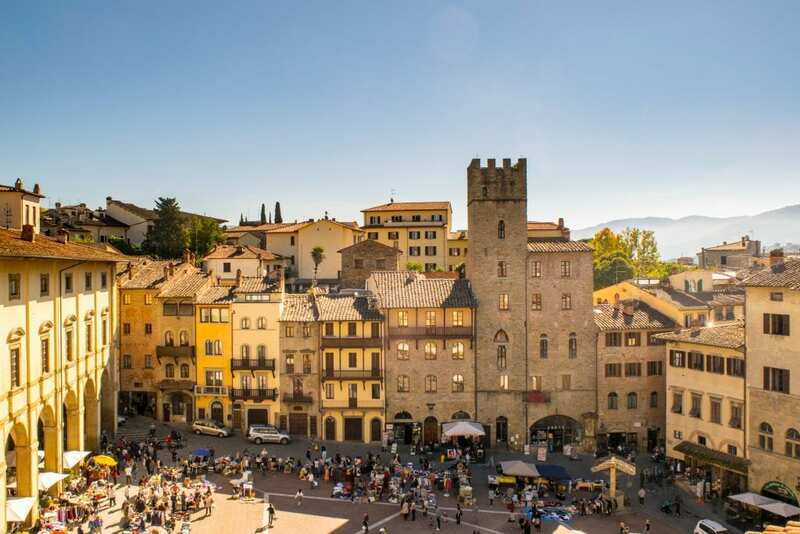 If you’re hoping to shop for antiques, see some beautiful off-the-beaten-path frescoes, or to admire one of the prettiest town squares in all of Tuscany, Arezzo is the stop for you. An easy day trip by train from either Florence or Siena, Arezzo is both beautiful and historical–there’s even a Roman theatre to explore! With 15 proud towers still standing where once there were hundreds, San Gimignano is as beautiful as it is interesting: once a major stop along the road for pilgrims, traders and more en route to Rome, San Gimignano spent centuries as an extremely wealthy city–thus spawning the habit of noble families building taller and taller towers to compete with each other over time. For video game fans, you’ll be able to pick out a scene from Assassin’s Creed II in the main square here! 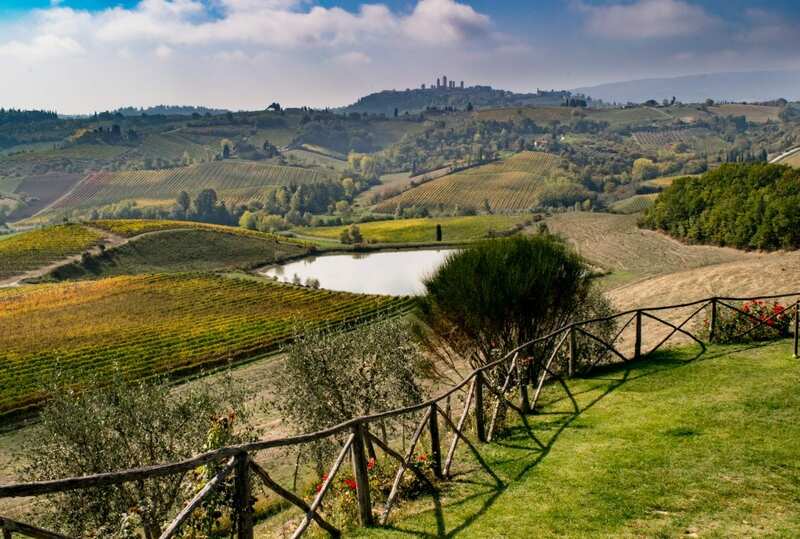 This popular tour will take through some of the best spots in Tuscany, including San Gimignano, in one day! It leaves from Florence. Even if you’ve never done much research into the region before planning a honeymoon in Tuscany, there’s still a good chance you’ve seen the name “Montepulciano” several times before… on a wine bottle. The outskirts of the city are overflowing with vineyards producing the famous wine, while the center is a maze of cobblestone streets and lovely piazzas just waiting to be explored. 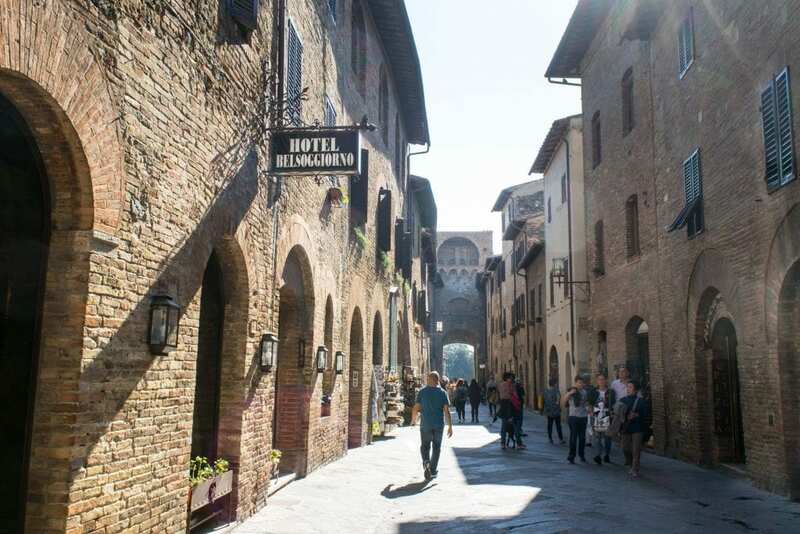 And, for those who noted the Twilight connection to Volterra earlier: both the New Moon book and movie were set in Volterra, but the movie was filmed here in Montepulciano. Sadly, a traditional Tuscany honeymoon like the one outlined here likely won’t have time for far-flung Elba, but just to tickle your fancy in case you have time for a particularly long summer honeymoon in Tuscany: Tuscany is home to its very own Mediterranean Island! 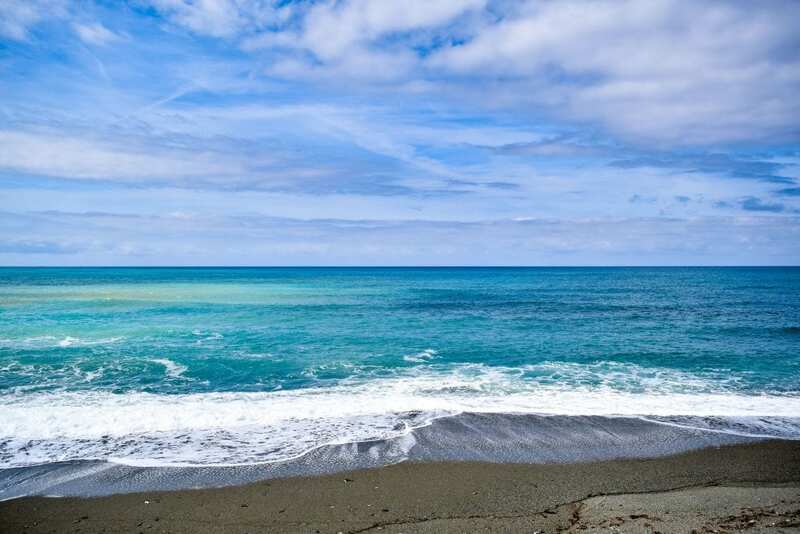 That’s right: without ever leaving the borders of Tuscany you can find yourself on a relaxing on a sailboat, going scuba diving, or eating fresh-caught seafood. For history lovers, Elba is also the first place that Napoleon was exiled to (he escaped back to France a little under a year later). There are essentially two ways of getting around easily during your honeymoon in Tuscany: relying on trains, and renting a car. Which choice is right for you is entirely dependent on your travel style: we personally love trains and find that riding them together is often romantic, and we’re not big fans of driving, so we avoid renting a car when we can. Tuscan cities and town centers tend to be very walkable, so this question really only applies to day trips and getting between cities (unless you choose a hotel in the countryside). If you have your heart set on road tripping the Tuscan countryside, though, and driving into tiny towns passed over by train stations, renting a car is likely the right option for you. The pros of traveling by train are pretty simple: you don’t have to drive, park, or pay for a rental car! Traveling by train during your Tuscany honeymoon is likely the right option for you if you are planning to base yourselves in Florence or Siena, if you’re happy to book organized tours for things like wine tours (which we recommend doing anyway, because it removes the stress of needing a sober driver), and if you’re not concerned with accessing the parts of Tuscany that can’t be seen by train. A few tips for riding the train in Tuscany: most destinations in Tuscany should be able to be accessed with regional train tickets, which have set prices and no assigned seats. For most destinations, booking in advance isn’t necessary. However, if you buy your tickets in person, rather than on your phone, you MUST validate your ticket before boarding the train. If you dream of controlling your own schedule in Tuscany, of uncovering hidden gems like Tuscany’s hot springs or tiny country towns long forgotten by train routes, then renting a car for your Tuscany honeymoon might be the right option for you! Rental cars are affordable, but insurance is a must–double check with your credit card and/or travel insurance provider that they offer coverage in Italy, because Italy’s notoriously aggressive drivers mean that some companies exclude them from their policies (or charge an extra fee). If you’re coming from outside the EU, you’ll also need to obtain an international driving permit before arriving. That doesn’t mean you should be scared to drive in Tuscany, as much of your driving will take place on near-empty country roads and well-maintained highways, but it is something to be aware of. 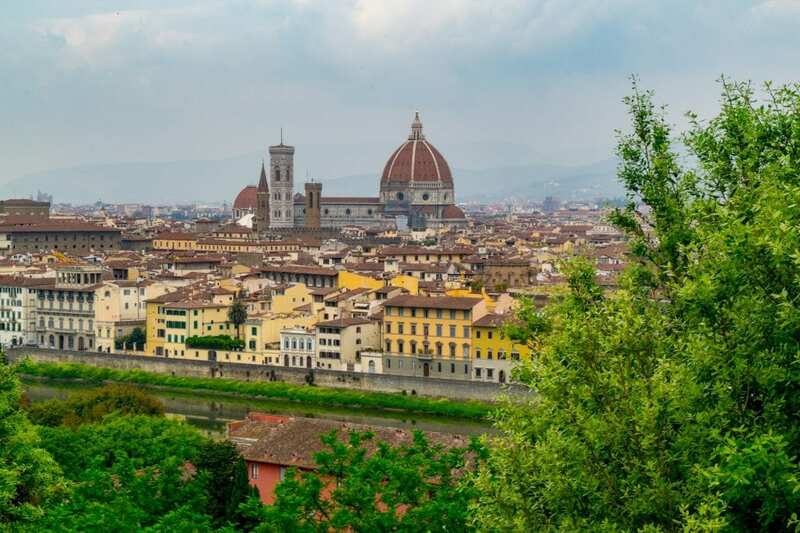 Keep in mind that you most likely won’t be able to bring your car into Florence (there are severe restrictions), and you wouldn’t want to anyway–we’d recommend only renting a car for the portions of your trip not being spent in larger Tuscan cities like Florence or Siena. In our totally biased opinion, we would say that the absolute best time to honeymoon in Tuscany is in the fall (particular in October), followed by the spring (particularly in May). The truth is, though, that any time of year provides delightful options for your Tuscany honeymoon–and if Tuscany is the honeymoon destination of your dreams, I wouldn’t let any time of year stop you from going. Spring brings beautiful flowers to Tuscany, and some potentially amazing weather (though there is a higher risk of rain). A spring honeymoon in Tuscany will allow you to visit before tourism and the heat pick up dramatically in the summer. Summer is the high season in Tuscany, so while you will have to deal with larger crowds and probably some hot weather, you’ll get the added benefits of having tons of tours available to you, plenty of access to delicious gelato and prosecco that are perfect to counteract the heat, and tons of sunny days. A fall honeymoon in Tuscany is–in our opinion–absolutely perfect. Crowds start to clear out as the season marches on (late October is the sweet spot in our opinion), but most tours are still operating and the weather can be majestic. Fall is also the season of the olive harvest, and if you’ve never had fresh olive oil, you’re in for a treat! Winter will see the harshest weather in Tuscany, but it also brings the smallest crowds and the lowest prices. Winters are generally mild, but they can be gray and wet–however, Tuscan towns are beautiful in the rain, art museums and restaurants can be cozy and romantic in the cold, and bundling up together to wander through streets is definitely an idyllic honeymoon memory! Beautiful Clothes — There’s a very good chance you’ll take more photos of yourselves on this trip than any other–you’ll want to look lovely for them! Be sure to bring your favorite outfits along, and possibly some new ones–though don’t forget you’ll likely want to shop in Tuscany, as well. — Honeymoons are all about indulging in fun and forgetting your worries, so make that a bit easier on yourselves and pick up a Pacsafe before you go. This portable travel safe is incredibly easy to use: simply put your valuables inside it, lock the safe to the most secure thing in your hotel room (usually a pipe or the base of a toilet), and rest easy knowing your things are safe. Our Pacsafe travels the world with us and we’ve always been so glad to have it along. 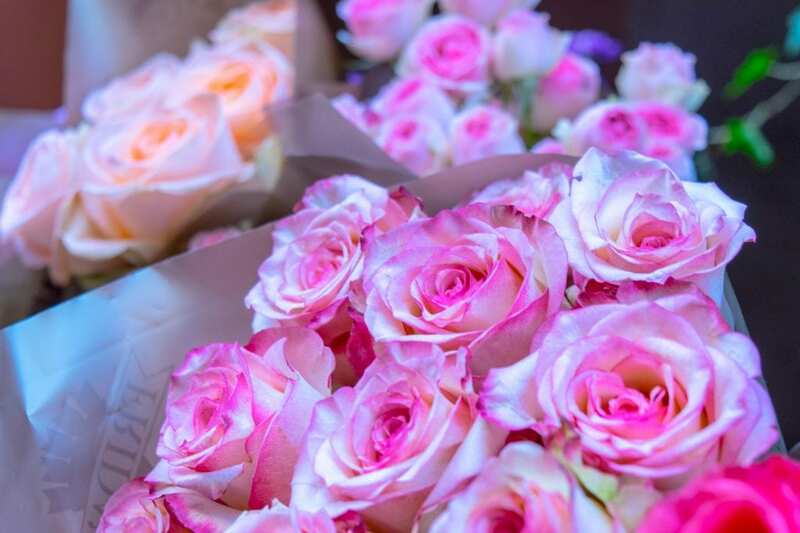 Extra Luggage Space — I’m normally not an enormous advocate of shopping more than usual while traveling, but your honeymoon is the perfect exception–after all, you’ll never be able to say “we picked this up on our honeymoon in Tuscany” again! I recommend buying at least one thing to wear, one thing to go in your shared home together, and one thing to eat (if it’s preservable, like wine, you might even consider saving it for your first anniversary)–and making sure that you can get them home safely. Florence is also known for its stationary, so if you’d like something memorable to compose your thank you notes on, you might pick up some of that as well! 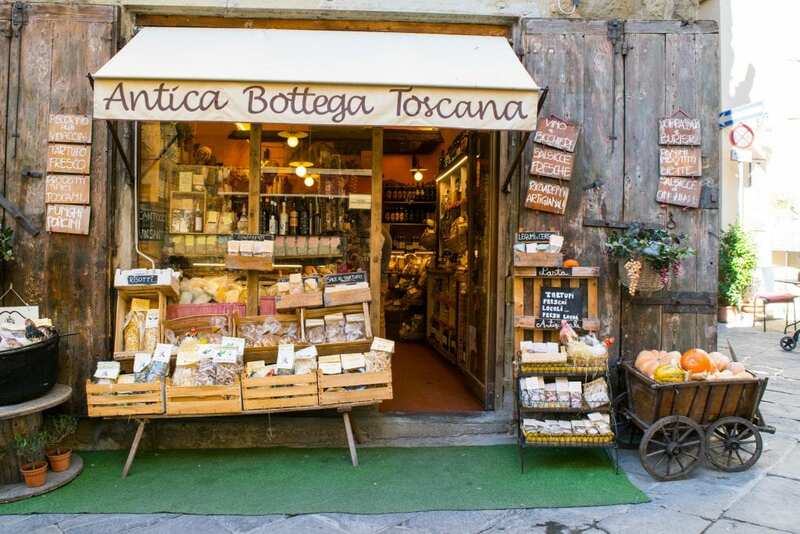 If you don’t want to deal with large bags, though, almost every souvenir establishment in Tuscany will be happy to help you ship your purchases home (for a fee). Travel Journal — Take it from someone whose honeymoon is blur even though it was a mere five years ago: you’re going to want to remember this. Take a few minutes each day to journal about what happened–those memories are so, so precious. , which is what I use now. The journal is set up so you can easily look back over a five-year period, and your only commitment is one sentence a day–how easy is that? I’m a little over a year into mine now and desperately wish I had started it when we first got married. Camera — All of our honeymoon pictures are on our cell phones (noticing a theme of correcting our mistakes in this list? ), and we regret it. Even though cell phone technology has come so far, you’re going to want to have some beautiful photos from your Tuscany honeymoon that go a bit beyond that. If that’s absolutely not your style, well, you know yourselves–but if you’ve ever been the type to bring a camera while traveling or to want a camera to snap photos with, definitely bring it along on your honeymoon in Tuscany. — Bit of a strange item for this list? Perhaps, but when you want to pop open a bottle of wine in your hotel room or cut a piece of parmigiano-reggiano that you picked up at the market, you’ll sure be glad you have it! Just be sure to place the knife in your checked luggage while traveling: airport security doesn’t tend to take kindly to knives in carry-on luggage. International Driving Permit — Just a reminder as mentioned above: if you’re from outside the EU and planning on renting a car in Italy, you’ll need an international driving permit to do so. These permits need to be obtained well in advance, before arriving in Italy, and you’ll need to keep your driver’s license from home with you as well. No, the rental car companies don’t always ask and you aren’t likely to be pulled over–but it’s better to be safe than sorry. A small extra cost before starting your honeymoon in Tuscany is worth it to avoid the risk of being denied a rental car or paying a hefty fine! Last but not least: don’t head off on your Tuscany honeymoon without travel insurance! I want to go on this honeymoon just by myself! I hadn’t thought of visiting Tuscany in the fall, but you’ve sold me! It’s the best! We probably won’t be there in the fall this year and I’m already sad about it lol. Oh my gosh, we are absolutely obsessed with Italy as well. Honestly, I don’t see how people wouldn’t be obsessed just by looking at your photos-they’re gorgeous! Thanks for a great share on Tuscany. All of your tips are so useful and spot on!! We also have an Italy travel addiction and had our honeymoon in Charleston before our obsession set in. However, maybe I need a second honeymoon, even if Charleston is absolutely lovely. But a cooking class in Tuscany is too perfect to pass up! Charleston is lovely as well, though–we loved traveling in the southern USA.